Golf has made a transition from a game to a sport. Courses are getting longer and equipment is getting better, making people hit it further. Being a golfer, you need to keep up your strength and stay fit! I spend a lot of time in the gym with my trainer Troy, and my sister is my workout buddy. It is always nice to have someone to motivate me, and to be able to do the same for her. That is what workout buddies are for! To make things fun, we use the physio ball for a lot of exercises. In using the physio ball you are able to strengthen your back and core, 2 important areas to maintain for a lifelong swing. Balance is another keep component you develop when using the physio ball. Having a good balance is also part of a good golf swing. Working with the physio ball, we also train the body’s natural awareness of strength and stability. Living a fit lifestyle only makes your golf game better over time. Keep working at it with me, it is a process that I challenge myself to everyday. ← Getting Your “L” On! You are the best workout buddy! your golf workouts are the best! 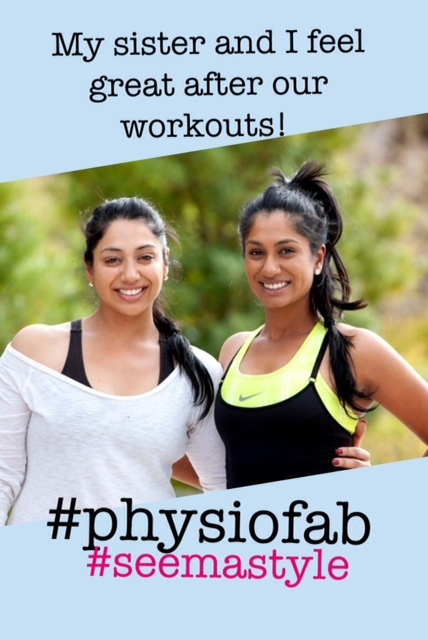 2015 Will Be Physio Fab! Tweet Me For A Birdie.